I grew tired of spending lots of money on laundry detergent. 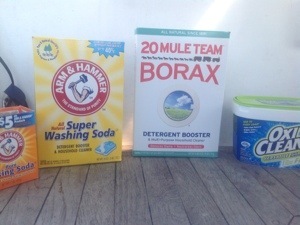 Since I live on a boat and have to carry my laundry to the laundromat, or other place, I could never buy the large, bulk, money saving size of laundry detergent. It took up too much room, and was too heavy to carry. On top of this, I would have to buy two types of laundry detergent: one for clothes and one for cloth diapers. For those of you who use cloth diapers, you know how expensive the detergent can be. The thought then dawned on me: why not make my own laundry detergent? And make a detergent that I can use for both diapers and clothes. Then I spent about a week researching different recipes for laundry detergent and thinking about the pros and cons of each. I finally decided on the below recipe. I made this while Capt’n was on his trip from the Dominican Republic to Florida, which was about five weeks ago. All in all I can say that a am pretty satisfied with this recipe. I live with a man and a toddler boy, so their clothes always have lots of stains. I haven’t been able to remove all the stains with this detergent. I still have to use a stain fighter solution. I am open to great stain fighting techniques though! 1. Finely grate the three bars of soap. 2. Mix all ingredients in a large five gallon bucket (or whatever large container you want to use). 3. 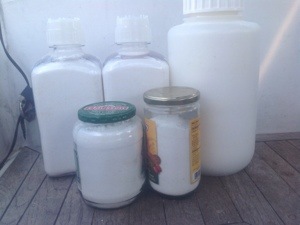 Put detergent in smaller, more manageable containers and enjoy! I price checked all items at three places: drugstore.com, Target, and Publix (grocery store). I was surprised to find the items were the least expensive at Publix. I cannot find the receipt, but from memory here are the costs of the items. So the total upfront cost was about $40. But it made a LOT of detergent. Not sure exactly how many loads in total though. The other great thing is that you use less detergent per load because there aren’t any fillers in the detergent. Now I put the laundry detergent in a smaller glass jar (I am now using a pasta sauce jar) to take with me up to the marina laundry room.